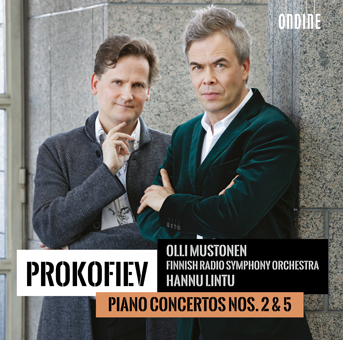 This is the second and final disc in a cycle of Sergei Prokofiev’s (1891–1953) piano concertos with pianist Olli Mustonen and the Finnish Radio Symphony Orchestra conducted by Hannu Lintu. The Gramophone Magazine wrote regarding the first volume in the series: "How many times have I regretted a shortage of fantasy, flair and fairy-tale imagination in recordings of the Prokofiev piano concertos? Well, here is a disc that takes all those qualities to the top." Prokofiev’s Piano Concertos are among 20th century masterpieces. Upon reading the score of the 2nd Piano Concerto before its premiere, composer Nikolay Miaskovsky wrote to Prokofiev: "When I was reading through your concerto tonight, lying in bed, I went almost crazy with admiration: I jumped and cried out, so that if I had neighbours, they’d have probably thought I’d gone mad." Prokofiev wrote this magical work just before World War I. The original score was destroyed during the Russian revolution, and Prokofiev had to re-write the concerto in 1923. Prokofiev's Piano Concerto No. 5 is completely different in nature than its predecessors. A stylistic change towards simplicity is evident in the work. Although Prokofiev considered naming the work "Music for Piano and Orchestra" he produced in the end a challenging concerto that tests any soloist’s technique. Prokofiev himself gave the first performance in Berlin on 31 October 1932.